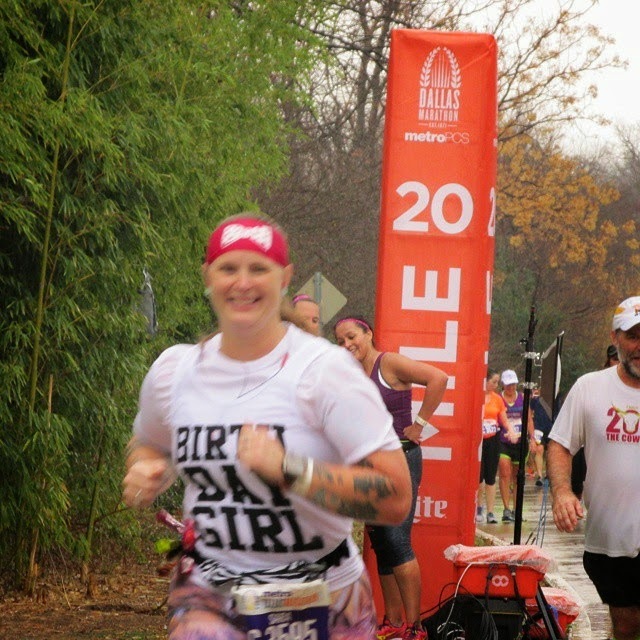 I'm not writing my Dallas Marathon recap yet, but I did want to write about the general experience surrounding my first marathon. I was so nervous coming up to the marathon. I had such a hard time falling asleep Saturday night, then I'd fall asleep and sleep well, then I'd wake up, and so on. I had set my alarm for 5am and woke up promptly at 4:55. I shut my alarm off so as not to scare the crap out of Amanda sleeping in the other bed. I got up and started getting ready. I knew there was a good chance it would rain before I was done running, so I did not bring my bluetooth earphones, but instead was using my regular earbuds. Anyway, I wanted to get to the area near the start as early as possible to get good parking. I had thought I would just park in the convention center parking garage, but when I had parked there the day before for the expo, I had lost satellite signal for my radio. Thankfully, there was a surface lot that was $5 cheaper than the garage right across the street, so I parked there. I had an hour until I would make my way to the starting area. Shortly after 7, I made my way to the start area and stood in line for FORTY MINUTES for the port-a-potty. Geez. I had planned to run with the 5:30 pace group, so after the port-o-potty, I made my way toward them. We started off when the race started and the pacer was going fast. Really fast. I looked at my Garmin and it said an 11:00-ish pace. Um...what? Then, at the half mile mark, there was a walk break. Ugh. So I said forget it and pushed on ahead. For the first few miles, we passed each other alternately before I finally ended up just pulling away from them completely and doing my own thing. I had toyed with the idea of bringing my water proof/shock proof point and shoot camera with me. I have a wrist strap that has a slide lock on it, so it's not like I would actually drop it. I eventually decided against it. However, as we were running through areas like Deep Ellum and the historical housing areas, I was starting to wish that I had brought it with me. Oh well. If I run this race again, I will bring my camera with me. Oh, and if I had brought my camera, I totally would have stopped at all the mile markers to take selfies with them. Haha! I did have to stop to use the facilities during the run. I knew around mile 4 that I would have to stop at some point and decided that I would wait until after the marathon split off from the half because the lines at the port-a-potties I was passing were way too long. Good thing I waited because right after the split there were really nice port-a-potties to use. I also used this moment to slip the Clif Shot gels (they have a handy little strap in the packaging that makes it easy to slip them onto a gear belt strap...they're hanging down and bouncing around, but whatever) that I had scored from their station not far before when I stopped to potty. They had another station later in the race. I scored 8 free gels, 1 of which I took during the race (I had taken 4 of my own gels...my gear belts only have 4 loops for gels). At mile 20, my friend Carina was there again (she had been at mile 7 as well...with her husband, but I didn't see him, just her because she was the one hollaring at me and chasing me down with a camera...haha). I was so exciting to see her again! I didn't realize that she had planned to do that. 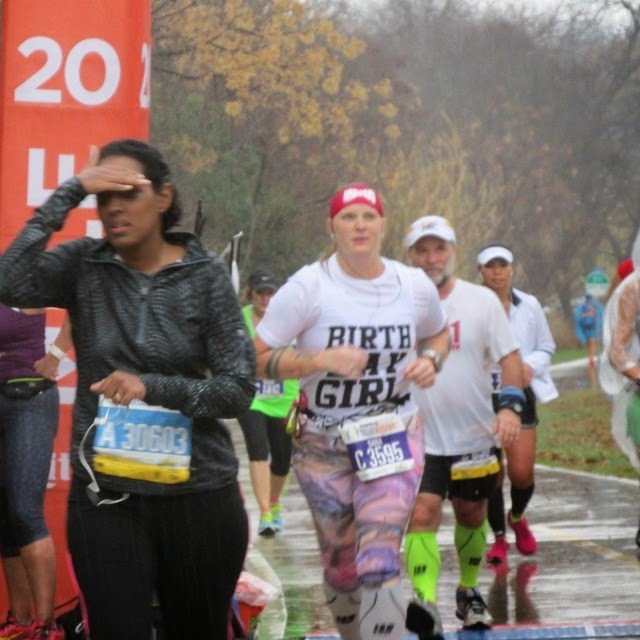 I knew she'd be at mile 7, so I was looking for her at that point. As I was running up, she got a couple good photos of me and boy was the grin on my face huge! I was having a fantastic time! see? there's that huge grin! She ran with me for about 2 miles which also coincided with the only time it decided to rain (read: pour) during my time on the course. She was very nice and offered me her running hat, but I declined. If it stopped raining (which it did shortly after she turned around to go back to her car), then I'd have a hat I didn't need anymore, so I toughed it out and it was all good. This was honestly one of my favorite points in the whole marathon. I got my fastest mile which just goes to show that I'm not going to my fullest potential. I'll get there eventually. SO...I'll save the rest for the recap after I've gotten the official photos. I'd like to talk about the post-marathon now. I had planned to take most of this week off from running with a 3 mile run tentatively scheduled for Saturday. I figured I'd be a little sore. I was going to take an ice bath when I got back to the hotel but that idea was nixed when I walked into my room and found the maintenance guy shop-vac'ing the carpet in front of the sink area that was soaked thanks to a leak from a floor above us. So, I waited for him to get done, then did my stretching and foam rolling. I did extra foam rolling and it hurt so good. My hips were a little stiff when Amanda and I made our way to Cheesecake Factory to meet up with Carina for my birthday dinner. The day after the marathon, before Amanda and I headed back to the Austin area, we went to the Dallas World Aquarium and then to the Dallas Zoo. By the time we got done with the zoo, I was more than ready to sit down. My feet and legs were so tired. Tuesday, I woke up and wasn't really sore at all. I'm sure it had to do with the extra foam rolling I did and with the 3-4 hours of walking we did at the aquarium and the zoo. I was going to maybe get another massage, but decided at that point that I didn't need it. Later in the day, I started itching to run. I woke up this morning, took the car for an oil change, did some craft shopping, paid myself up current on my gym membership, then went home and got ready to run. I decided I would do a 10K because I had just received the medal for a virtual 10K I had signed up for in the mail the other day. I felt really good. I mean REALLY GOOD. 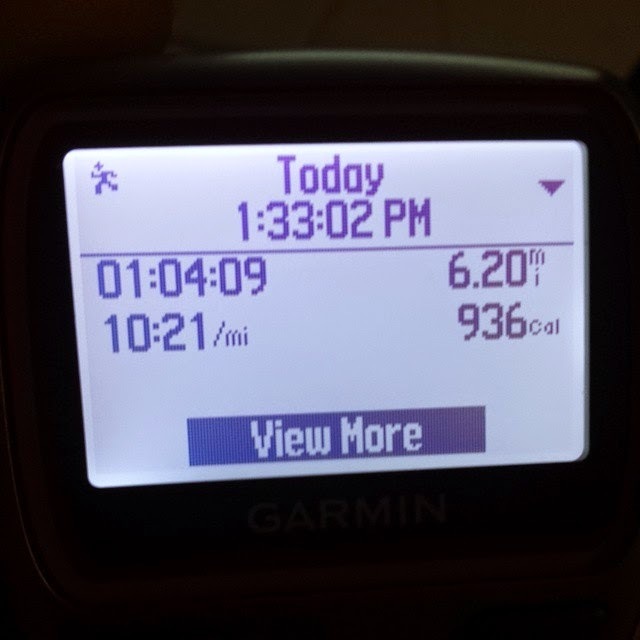 I started out doing what felt like a good pace. I hit the 1 mile mark and it was 10:14. What?!?!?!? Okay, cool, I just got excited and went out fast, the rest of my miles will be in the 11's. Mile 2...10:34. Mile 3...10:24. Hmmm. Mile 4...10:23. Mile 5...10:19. Mile 6...10:21. And the final .2 mile at a 9:39 pace. Geez. I really was feeling great! Oh and it started raining around mile 1.5, so at a little after mile 2, I stopped into a convenience store and asked for a plastic shopping bag and put my bluetooth earphones in it and ran sans music for most of the run. Not horrible. I still prefer to run with music, but running without isn't horrible. I've done it before when the battery has died in my earphones, but I'm usually no more than 2 miles from being done when that happens. 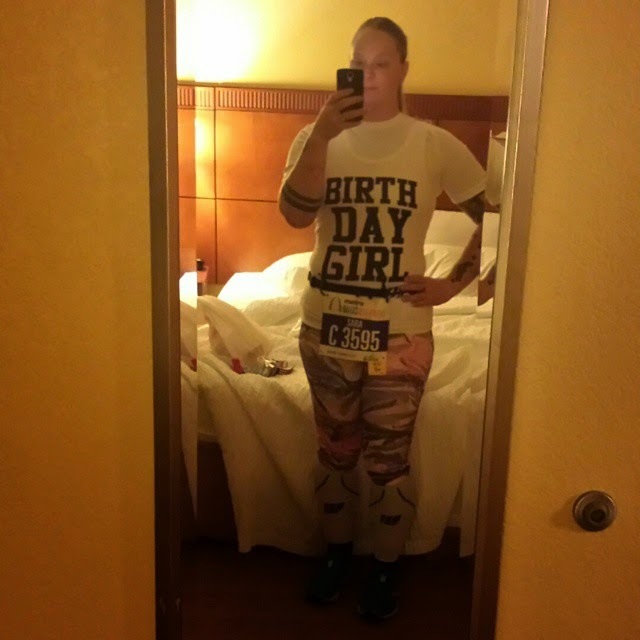 Anyway, like I said, I did not plan to run just 3 days after completing my first marathon, but I did. I couldn't help it. I was compelled. I received my registration code for the Austin Marathon yesterday, so I went and registered. 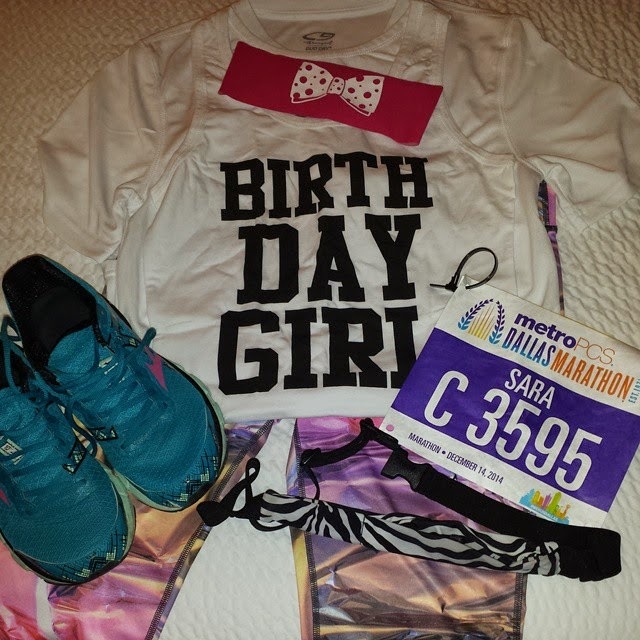 So, I am officially registered for my second marathon!!! So exciting!!! And, I've decided that I now want to join a group called the Marathon Maniacs (maybe you've heard of them?). To qualify, I have to complete 3 marathons within 90 days. So, I've got the Dallas and the Austin...just need a 3rd one done before March 14th. The Army Marathon happens on March 1st. Soooo...by the end of January, I will pay my registration for the Army Marathon so I can qualify for MM status!!! 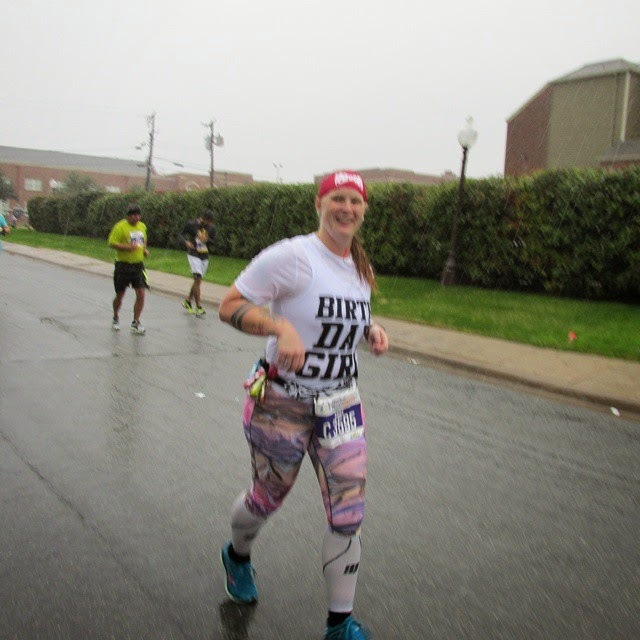 i totally agree with you and you do have way more experience than i do with running marathons, but i felt great, i was feeling compelled to run and i just naturally ran fast-for-me. i didn't even really pay attention to how fast i was going until i was done. and believe me, a coaching voice of reason is something i do need.